In 1993, I received my bachelor's degree in geological sciences from the University of San Juan, in Argentina. In December 1996 I defended my Ph.D. thesis on the taphonomy and stratigraphy of the Ischigualasto Formation, the anatomical description of Saurosuchus galilei, and the phylogeny of rauisuchids. Upon completion of my graduate work, I moved to The University of Texas at Austin in May of 1997 to conduct postdoctoral research with Dr. Tim Rowe. Together we have CT- scanned several archosaur specimens from the Ischigualasto Formation. 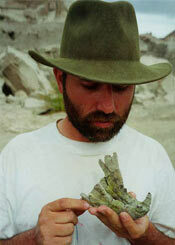 I participated in numerous fieldwork expeditions, primarily in the Triassic Ischigualasto Basin. I also participated in the exploration of Upper Cretaceous sediments in south Mendoza and Lower Jurassic in the north of San Juan, both in Argentina. In 1998, I was part of the crew of Tim Rowe's expedition (UT Austin) to the Lower Jurassic Kayenta Formation in the Navajo Nation, Arizona. In 1998, I was hired as Collections Manager for the Vertebrate Paleontology Laboratory of the Texas Memorial Museum at UT Austin. I also was instrumental in the completion and mounting of a cast of the pterosaur, Quetzalcoatlus northropi, in the Great Hall of the Texas Memorial Museum. In April of 2000 I returned to San Juan. I am in charge of the Division of Paleontology of the Natural Sciences Museum. My research interests lie in basal crurotarsal archosaur and archosauriforms. I am also interested in the alluvial architecture and taphonomy of terrestrial environments. I also want to contribute to the knowledge of the biostratigraphy of the Triassic, trying to obtain additional data on paleomagnetostratigraphy and radiometric dating from fossiliferous sequences in Argentina and Brazil. I will be working this year in the Lower Jurassic Río del Colorado Formation (May 2000) and in the Upper Triassic Ischigualasto and Los Colorados Formations (September-October 2000). Alcober, O. 2000. Redescription of the skull of Saurosuchus galilei (Archosauria: Rauisuchidae). Journal of Vertebrate Paleontology 20:302-316. Alcober, O., J. P. Milana, R. Martínez, and J. Parrish. 1997. Evidencias del Cambio Climático Globel Triásico en el Sur Sudamericano. XII Jornadas Argentinas de Paleontología de Vertebrados. La Rioja, Argentina. Alcober, O. A., and J. M. Parrish. 1997. A new poposaurid from the Upper Triassic of Argentina and a consideration of poposaurid phylogeny. Journal of Vertebrate Paleontology 17:548-556.